Jan Vertonghen and Harry Winks could both miss the north London derby against Arsenal due to hip injuries, says Mauricio Pochettino. Eric Dier and Dele Alli are already sidelined but Spurs will have striker Harry Kane available for Saturday's heavyweight clash at Wembley. Spurs will run late fitness tests on Winks and Vertonghen but Pochettino is unsure whether Dier or Alli could be ready for Tuesday's Champions League trip to Borussia Dortmund. 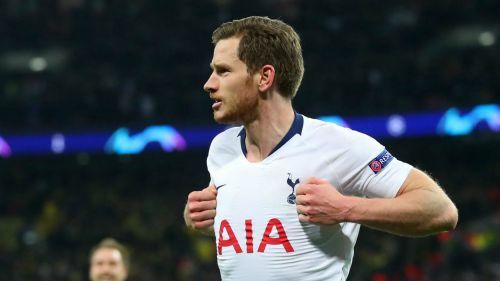 "I don't know because now we are going to train in the afternoon and we'll see," Pochettino told reporters when asked about Vertonghen and Winks. "I cannot say 50-50 or a percentage. We need to assess and see if they will be available or not." On England duo Alli (hamstring) and Dier (tonsillitis), he added: "I don't know. Now we're focusing on tomorrow. "After tomorrow we're going to assess both and we'll see if they can be in contention [for future games] or not, but we'll see in the next few days." @dele_official (hamstring) is in late stages of rehab. Spurs go into the game third in the Premier League but have lost their last two games at Burnley and Chelsea to slip out of the title race and allow Arsenal to move four points behind them. The race for Champions League qualification looks likely to go to the wire and Pochettino says Spurs will not lack motivation in the derby, having won five of their last seven home Premier League games against Arsenal. "Of course, to motivate for this type of game is an easy job," Pochettino added. "We don't need to motivate them. We know very well what it means to play against Arsenal. "We know that we're going to be very motivated and we'll have a team in front that is very motivated too. We've played twice against them this season. One Premier League game at the Emirates that we lost, another in the EFL Cup that we won. "Of course, it's going to be tough, the third game of the season against Arsenal. They have very good players, they are doing a very good job. Unai Emery is a great manager, I know him very well. "Always a derby is tough, after my experience here in nearly five years every time that we played against Arsenal it was a very tough game."